The Developer Summit had around 23 attendees. We held engaging discussions on topics like bug busting, hackathons, Google Summer of Code project ideas, FreeBSD on Pinebooks, and more. These face-to- face opportunities with other contributors from the community are so valuable for the growth and longevity of the Project. People get inspired by others and go home energized to work on their own projects, or join other projects they found interesting when discussed during the event or in the evenings over a beer. There was so much interest from more people wanting to attend this summit, that next year, we’ll find a larger venue to allow more people to attend. FOSDEM started the next day at the Université libre de Bruxelles. 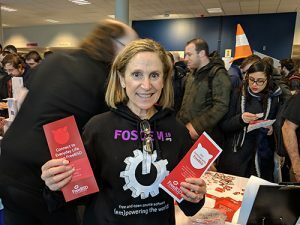 FOSDEM is a free and non-commercial event organised by the community for the community. The goal is to provide free and open source software developers and communities a place to meet. It’s totally free! I believe there were over 8000 attendees this year. It does make for very crowded hallways. We were fortunate to get a stand again this year, and we were again located next to the Illumos project. Allan Jude tends to stand in between the two tables, so he can talk ZFS to people who visit either project. As usual, we had a lot of FreeBSD volunteers helping to staff the table. These are people from all over Europe, who are passionate about FreeBSD. There was a BSD Developer Room (devroom), which allowed up to 100 people interested in the BSDs to meet and listen to 13 talks on the various BSD projects. 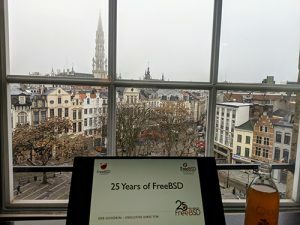 I kicked off the devroom talks with my 25 Years of FreeBSD presentation. You can find the recording here . I spent the rest of the day talking to people who stopped by our table, learned about more companies using FreeBSD, and talked to other open source community members. I was thrilled at the amount of people who stopped by our table to talk. Though, we quickly ran out of our fabulous luggage identifiers and tape measures. 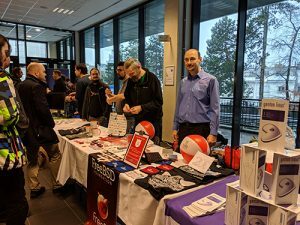 We ended up, giving away 1000 stickers, “selling” 40 t-shirts, and handing out lots of Getting Started with FreeBSD fliers to help new people get started with FreeBSD. I witnessed many of the volunteers having engaging, in-depth technical discussions on specific parts of the kernel and features. I was excited to see Shteryana Shopova there, getting back into FreeBSD. She ran EuroBSDCon 2014 in Bulgaria and worked on various parts of FreeBSD, focusing on networking. I was also able to attend Jonathan Looney’s “Netflix and FreeBSD – Using Open Source to Deliver Streaming Video” presentation in the main track. This was a powerful testimonial to the benefits of using FreeBSD. The room was packed and people came up to Jonathan afterward to ask questions. You can see his talk here. The second day was just as crazy and crowded, though there were moments when you could actually walk through the hallways without getting elbowed. 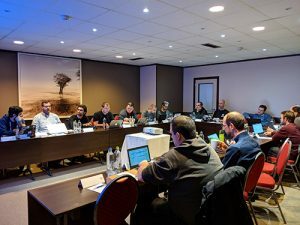 Besides connecting with more commercial users and getting people to play around with FreeBSD on their desktops, some of us within the FreeBSD community talked about having more FreeBSD tracks and workshops at more conferences in the next 12 months. This included a discussion on having a FreeBSD track at linux.conf.au, running an Intro to FreeBSD workshop at All Things Open and womENcourage, just to name a few. 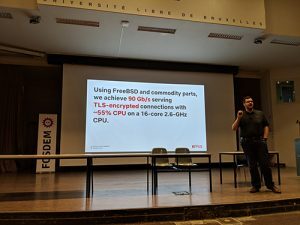 In conclusion, FOSDEM is a must attend conference for promoting FreeBSD. There were a few FreeBSD presentations in the main track, and we will encourage more people to submit talks in the future to grow its visibility. We look forward to having a continued Foundation presence there so companies and users can talk to us about what they are doing and what we can do to help, as well as continuing to sponsor the FreeBSD Developer Summit, and of course provide all the cool swag.